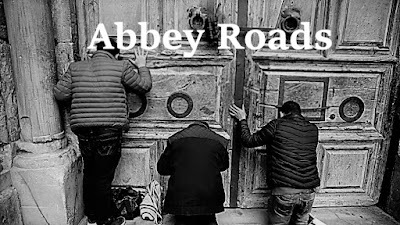 Abbey Roads: The Spiritual Marriage of Blessed Bernardo Francisco de Hoyos, S.J. The Spiritual Marriage of Blessed Bernardo Francisco de Hoyos, S.J. There is a young saint - recently beatified, whose devotion led him to the most exquisite union with the Sacred Heart of Jesus ... the spiritual marriage. Yes. It is no less strange however, that the Word, left his Father, to become one with man, to become Bread from Heaven. 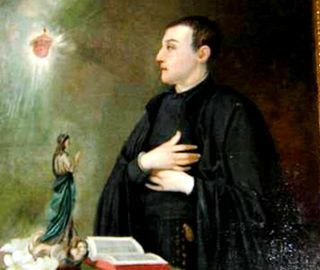 Blessed Bernardo Francisco de Hoyos, S.J., First apostle of devotion to the Sacred Heart of Jesus in Spain. I read someplace that Bl. Bernardo's intercession is especially helpful to those who struggle with the vice of impurity. I think Bernardo's devotion to the Sacred Heart - the complete surrender of all his affections - is an antidote to all impurity. The grace of espousal seems to me to be similar to the consummate love of Jesus in the Eucharist for us, wherefore he gives us his body, blood, soul, and divinity at every Communion. Isn't it like that? Isn't that total union what we are called to? I like to think so at every Communion - even when I feel nothing, see nothing, hear nothing - it seems especially then that faith supplies. I never had experiences such as those Bl. Bernardo participated in - I'm just grateful to be able to be recollected after each Communion. Knowing he is there and I am with him. I like the way Bl. Bernardo put it: “I see that everything in my heart is moving towards God, drawn like iron to a magnet. It desires only God, searches only for God, and longs only for God….” For Bernardo, that was his constant state - and he remained faithful to the graces he received. For me, perhaps this desire is only imperfectly experienced in the thanksgiving after Communion. Which is why I never want to waste those moments of recollection. In the ascetic-mystical life of the saints, God himself purifies the soul of disordered passions in and through purifying trials and temptations. Thus proving true Christ's words, 'what is impossible for man is possible for God.' Blessed Bernardo was no exception. Apart from being favored by mystical graces, heavenly visions and saintly visitations, Bernard also suffered excruciating attacks from demonic forces. As happens to those who arrive at the threshold of mystical life, he was not spared “the dark night of the soul”, through which he struggled for five months. During this period, the devils began to taunt him: “Now you will see, you sanctimonious hypocrite, what it is to trifle with God when you fall into His hands!” His mind was filled with images of God as a Just Judge, Who was displeased with him. Bernard became despondent. His meditation, Mass, Communion, penances… instead of assuaging his sufferings, made him feel more wretched. The great graces and favours he had received in the past months now appeared as objects of ridicule. He could not find comfort in his companions, either. The periods of recreation after meals degenerated into pure torture. In despair, he felt a furious urge to beat his head against a wall, to gnaw his lips or tear out his hair, or even jump out the window. More, he was violently incited to blaspheme God, the Blessed Virgin, the angels and his most beloved saints. Whenever he begged God for assistance, the devil would taunt him by saying that he had become unworthy of any grace because of his degenerated behavior. Bernard’s biggest harassment was in the temptations regarding impurity; he was bombarded by obscene thoughts and his reactions brought him to tears and made him gnash his teeth. Worst of all, he was getting more and more convinced that all the divine favors he had presumed he had received in; the past were merely illusions and only snares set up by the devil to drag him to hell. Blessed Bernardo died on November 29, at the age of 24 in 1735. Interesting. I always learn something new from you. Thank you. WOW...thanks so much for this post. I had read some of those things before but each time they seek so fresh and new. It makes total sense that male or female can experience the mystical marriage because we are talking about a spiritual union. Blessed Bernardo of Jesus is definitely on my personal saints list. Oh and dare I add...I am going to pray that in Blessed Bernardo you have found a new subject for your awesome artistic talent. If I was a rich man I would commission this of you! I like this guy! Do you have any sources or books your could recommend?